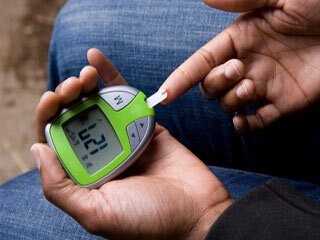 People with diabetes need medications to control blood sugar levels. Insulin is a type of diabetic drug used for controlling blood sugar levels. Insulin is a hormone that helps in metabolism of blood glucose. Glucose is the type of simple sugar that the cells use for energy. Everyone with type 1 diabetes and some people with type 2 diabetes need insulin (a type of diabetic drug) treatment to maintain blood sugar levels. Your doctor will prescribe insulin to maintain your blood sugar level as normal as possible. Good control of blood sugar helps you to stay healthy and prevents the complications of diabetes. Standard shot: Like other medications which are given as injection insulin can also be given as shots by syringes. Insulin is injected under the skin with the insulin syringe. This is the commonest and the cheapest way of taking insulin injection. Insulin pen: In this a pen-like device with a needle and a cartridge of insulin is used. This is more convenient and accurate for injecting insulin as compared to the regular insulin syringe and needle. Insulin infuser: In this a small tube is inserted just beneath the skin which is left in place for several days. Insulin is injected through the end of the tube rather than repeated injection through the skin as with the regular insulin syringe and needle. The major advantage is that you don’t have to prick every time for insulin injection. Jet injectors: Jet injectors administer insulin, without using a needle to make a tiny hole. A pressure system delivers a jet of insulin through the skin with pressure. Insulin auto injector: This is useful for people who have difficulty in injecting themselves. The device automatically inserts the needle and injects insulin under the skin. Insulin pump: People who use insulin pump hold the pump in place on a belt or keep it in the pocket. Insulin is present in the pump which is connected to a small needle inserted under the skin by a plastic tube. The needle is remains in place for several days. 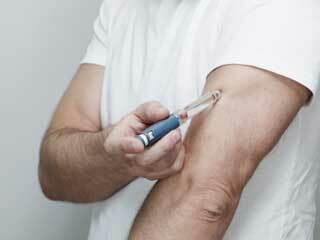 Insulin is administered by the pump automatically through the needle under the skin. If you take insulin (a type of diabetic drug) and are not satisfied with the standard way of injecting insulin with a syringe and needle contact your doctor to know your options. Dr Poonam Sachdeva, our in-house medical expert talks about the why what and how in diabetes.